In 2014, the group Capoeira Cameleão started the project Projeto Cantigas e Brincadeiras de Roda in the Cristo Rei neighborhood of Pato Branco. The project provides free capoeira class to children between the ages of five and eleven. The project is maintained from a partnership between Capoeira Cameleão Group in Pato Branco and Academia ACCC ad Mercado Econômico. The classes, which have been taking place three times a week for three years, include recreational activities, folk dances, instrument practice and music, as well as the movement of capoeira. However, learning goes far beyond theory and practice of the art. According to Agnaldo Luiz Rampanelli, coordinator of the project, students are also taught important values, such as discipline and the importance of education. The project began with eight children and today has approximately 50 regular participants. According to teacher Diego Drudi Sanches, students who have been participating for even one year have significantly improved their motor skills and flexibility. Every year in March, the Católica de Santa Catarina University in Jaraguá do Sul hosts Projeto Sonho de Ferias, an event promoted by the Jaraguá do Sul Business Association (Acijs). About 70 students between 8 and 10 years old from the municipal schools Ribeirão Cavalo and Professor Gertrudes Steilein Milbratz, participate in cultural and recreational activities throughout the day. Capoeira workshops, painting with gouache, face painting, collage, games, oral health workshops and storytelling were offered. The programs aim to awaken the vision of patriotism, regional culture, community social development, hygiene, prevention of drug use, and encourage fellowship, solidarity and fraternity. The program is supervised by 27 university students from different courses that participate in the Community Project – a curricular component that provides students with 30 hours of collaboration in social projects. comments law student Bruna Karina Postai, who participated in Projeto Sonho de Ferias for the second time. Ana Paula Fliegner dos Santos, the social worker associated with the project, emphasizes that the initiative is an opportunity for learning for both children and students: children get to take advantage of the school holidays in activities that awaken their curiosity of the world, university and community actions; and students who have the opportunity to engage in community action, thus contributing to a better world. For participating children, this is a great opportunity to have fun and learn to live in a healthy society, recognize the importance of valuing life and make new friends. Projeto Sonho de Ferias aims to promote integration between children and adults; raise awareness about the importance of preserving the environment and value the importance of schooling through educational and recreational activities. In addition, the program highlights the need and importance of public and private entities to be in tune with the surrounding communities. The Marist Solidarity promotes and defends the rights of children and young people through programs and projects. The Marist Institution has consultative status with the UN Commission on Human Rights through the Marist Foundation of International Solidarity. The network develops initiatives for children’s rights, and also directly serves about 16 thousand children and young people in situations of social vulnerability. The Centro Marista Dourados (MS) uses Capoeira and its various expressions, including dance, music, game, fight, sport, culture, folklore, history and philosophy, to create a sense of community and belonging, inspiring cooperation and mutual respect, in physical, cultural, social and leisure activities. Last year, the center hosted its second annual capoeira festival, with mestres attending from many regions and states of Brazil. The center hosts samba, maculelê, and benguela classes, as well as forums on Afro-Brazilian culture. The objective of CEDUF is to produce knowledge, train professionals, advise special education services in the area of ​​Physical School Education, Physical Activity and Health and Sports. It carries out sports training, movement, gymnastics and bodybuilding with the purpose of including disabled people in society through sports. 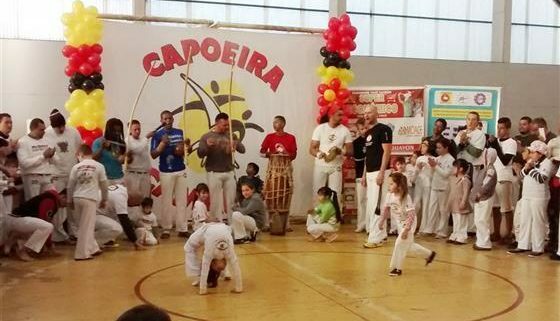 For the last 5 years, CEDUF has held a Special Capoeira Encontro. 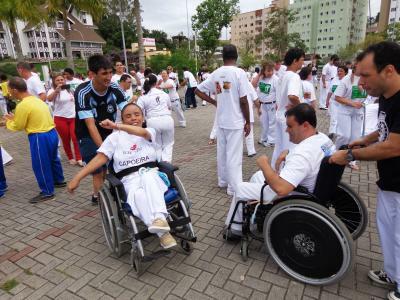 The Catarinense Foundation for Special Education (FCEE), a subset of the CEDUF, hosted the Encontro after conducting a survey on how many institutions from Santa Catarina offered capoeira classes inclusive of people with disabilities. The municipalities of São José, Brusque and Nova Veneza have hosted the encontro in the past with an average of 200 people. In 2016, participants from the municipalities of Garopaba, Pinhalzinho, Guabiruba, Camboriú and Rio do Sul also attended, in addition to participants from the original Encontro, coming from São José, Brusque, Biguaçu, Celso Ramos and Nova Veneza. “Socialization and citizenship were the strengths of my father’s philosophy, but I never imagined that capoeira would reach such a high point,” said Manoel Nascimento Machado, Mestre Nenel, son of Mestre Bimba, in praising the success of the Encounter.”I’ve never witnessed such a solid job with people with disabilities, both in terms of quality and quantity of students and the level of organization,” he said. Asociação Civil Capoeira Cidadã was founded in 2005 by a group of capoeiristas and community members who recognized the potential of capoeira as a social inclusion tool. The organization hosts various programs at their headquarters, the Capoeira Cidadã Cultural Center, including handicrafts and instrument-building, educational support and tutoring, crafting classes and computing, in addition to regular capoeira classes. The center also is home to the “Biblioteca Mestre Peixinho,” or “Mestre Peixinho Library,” where students have access to over 1400 books. Each program at Capoeira Cidadã Cultural Center has carefully articulated objectives and purpose. For example, handicrafts and instrument-building give students an opportunity for future income-generation while they learn to make caxixis, berimbaus and atabaques. Students are also able to develop leadership skills through “Monitoring,” or teaching other students these techniques. Students also receive capoeira-themed, educational support, as they are able to study the Portuguese language to interpret capoeira songs and texts, and practice mathematics through calculations of rope measurements and quantities of instruments. “I started on the project at age 10, today I am 19, almost half of my life was participating in the project. I am very grateful for everything the project has given me to this day, as moments of happiness, learning and a lot of training to be a good citizen. The project is a way to take the children off the streets and show a little more about a part of Brazilian culture that is little publicized in our own country. I believe we can help these children to have a better future and make them real citizens. When I got to the project it was very hyperactive, I was fighting a lot with my brother and at school; But the project showed me that not everything is resolved with a fight, but with dialogue. I learned a lot about hierarchy, respect for others and, above all, humility. He has added a lot in my life and I am always learning. I thank my teacher and all the others who have always helped me in this institution,” says Estagiario Galo. Favela Mundo works in various regions of Rio de Janeiro, including Engenho de Dentro, a northern region of Rio. With work focused on education and culture, the organization gives free class to children and teenagers 6-18 years old in Capoeira, Maculelê Brazilian dance, ballet, jazz, theater, drawing, guitar, jongo, choral and circus For parents and over 16, there are courses offered for handicrafts, makeup and beauty, and nail art. “For the most part, the profile of these children is one-parent families of women. Regardless, there are cases of unstructured families, living with violence and aggression. That’s why working with art becomes so necessary,” says Marcelo Andriotti, creator of the NGO. Rio de Janeiro State University graduate students in Pedagogy complete internships with Favela Mundo, guaranteeing teachers. The organization has served over 1200 people since its foundation, and in 2014, Favela Mundo received an award from United Nations. The NGO was the only Brazilian organization selected for social inclusion at the World Cities Day Event.